This December, our volunteers will be working hard to build a new home for the Frias Moreno family just outside of Tijuana, Mexico. Please take a moment to meet this large family and learn a little more about the people your donation could help. The father, Fernando works full time at the local hardware store. His wife, Judith works the night-shift at a local cafeteria, but spends most of her time raising six children: Kaline (18), Josue (12) Anuar (11), Hannah (8), Layla (6) and Iker (5). Currently, this large family lives in a one room house with a leaky roof that is hardly protecting them from the elements. By providing them with a safe, new place to call home, we hope to make a big difference in their lives. Please help us build this family of eight a new home this December! A HUGE thanks to all of the donors who helped make this build possible. 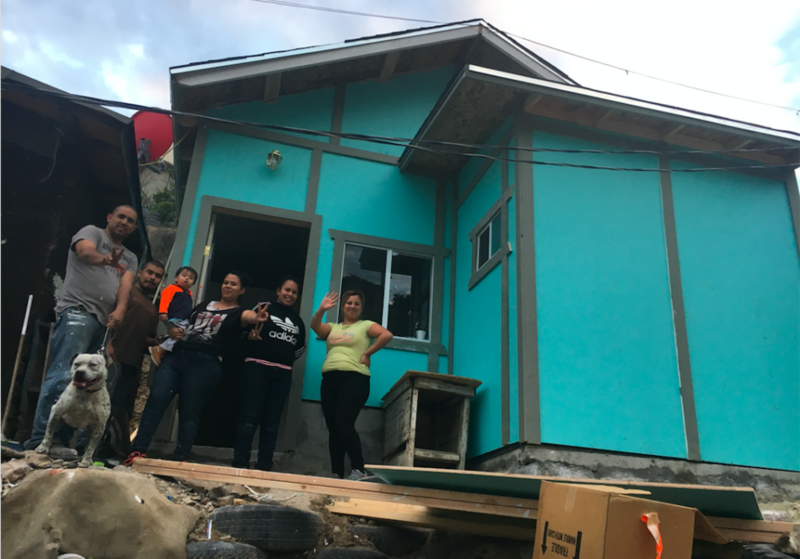 Thanks to all of you, the Frias Moreno family is now sleeping in their brand new home. In addition, we want to thanks our volunteers (Dave Kinnoin, David Ihnotic, Cory Ihnotic, Breeana Ihnotic, Alison Ihnotic, Amanda Eskildsen, Morgan Jawitz and Victor Campos) who physically turned your generous donations into a brand new home for this family. Here’s to all of you!